It turns out Gordon Ramsay's foul-mouthed tirades and verbal abuse can really have a negative effect on a restaurant's business. 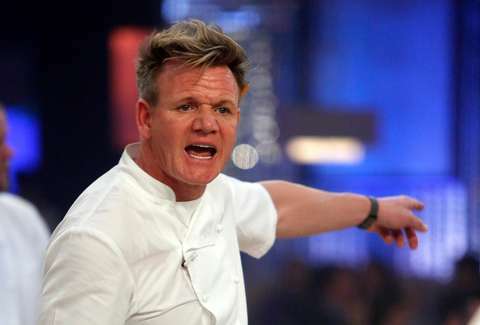 A New Orleans restaurant that appeared on the chef's Kitchen Nightmares program in 2011 filed a lawsuit against Ramsay and the show's producers, in a testament to the enduring damage Ramsay allegedly brought to its image. The lawsuit, filed in Orleans Parish Civil District Court by the parent company of Oceana Grill, stems from old footage posted to Facebook earlier this month. It shows Ramsay vomit after smelling an old box of shrimp, in addition to finding three dead mice in a mouse trap among other revolting snippets during the restaurant's episode on the show. The video garnered a lot of attention in a short amount of time, accruing over 1 million views in 24 hours before getting deleted, according to the New Orleans Advocate. But another video showing the same footage was posted to the Kitchen Nightmares Facebook page after that, racking up another 1.2 million views in less than a day. Now, the restaurant's parent company, Cajun Conti, is suing Ramsay in a defamation suit, alleging the clip portrays inaccurate events. Oceana Grill's legal trouble with Kitchen Nightmares dates back further than this month. In 2011, Cajun Conti sued Fox Broadcasting and Upper Ground Enterprises in an effort to get the episode pulled from the air. The suit was unsuccessful, but the restaurant did reach a settlement with the broadcaster, stipulating $10,000 be paid to Oceana if "remixed" footage of the episode aired, and that an updated statement on the restaurant's status accompany the episode. According to the Advocate's report, Oceana typically draws a crowd and does good business, echoing a statement from the restaurant's lawyer, Daniel Davillier. He claims the footage shows Oceana "as a failing restaurant when in fact it's very successful. The food is great and people love it. They should come down and see for themselves," he said.